Philadelphia, PA (April 2, 2012) – The Radnor Township Environmental Advisory Council (EAC) was recently honored with a Green Award from Main Line Today and recognized as an "Environmental Champion" for its environmental stewardship. 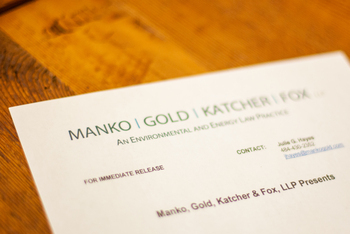 EAC Chair, Brenda Hustis Gotanda, is a partner with the environmental and energy law firm of Manko, Gold, Katcher & Fox, LLP (MGKF). Gotanda notes that "the EAC's proactive approach to preserving and enhancing the environment aligns with Radnor's motto of "making a great place even better.'"